I was bewitched by this fascinating medieval hamlet with its colorful houses, well-kept but not cutesy, and the surrounding rolling hills, where vineyards, olive groves, and other greenery design patches that look like exquisite crochet. Right away, I knew that I wanted to go back and spend more time in that town which stole my heart. 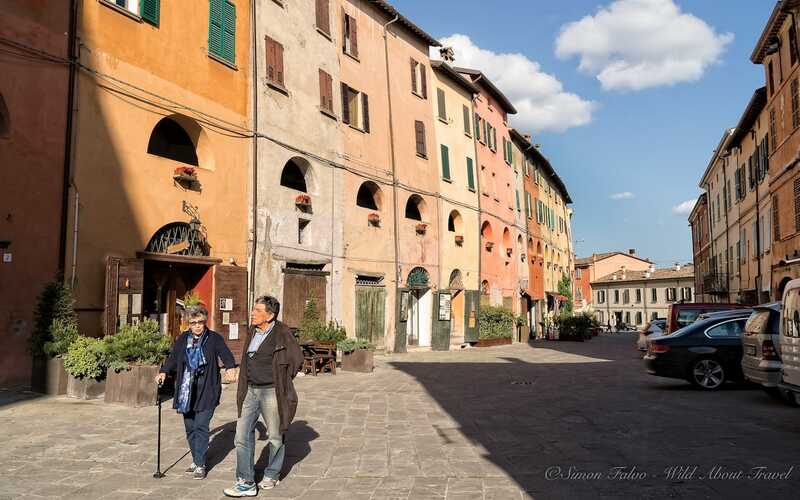 I felt there were many things to do in Brisighella, regardless of its small dimensions, and that it was a perfect spot for slow travel, a place to savor rather than merely visit. The right time eventually came at the and of April, when I was invited in Rimini to speak at the Europe Famous Hostels’ Staff Meeting. I had a couple of spare days at the end of the event and thought that there was no better way to spend them than taking a break in Brisighella, on the way back to Milan. I bought my train ticket, booked two nights in a bed & breakfast right in the center, and off I was! I knew that going back to a place that had enthralled me in a matter of minutes was possibly a risk, and I wondered how I would feel. Would I find Brisighella as charming as the first time? Would I get bored? 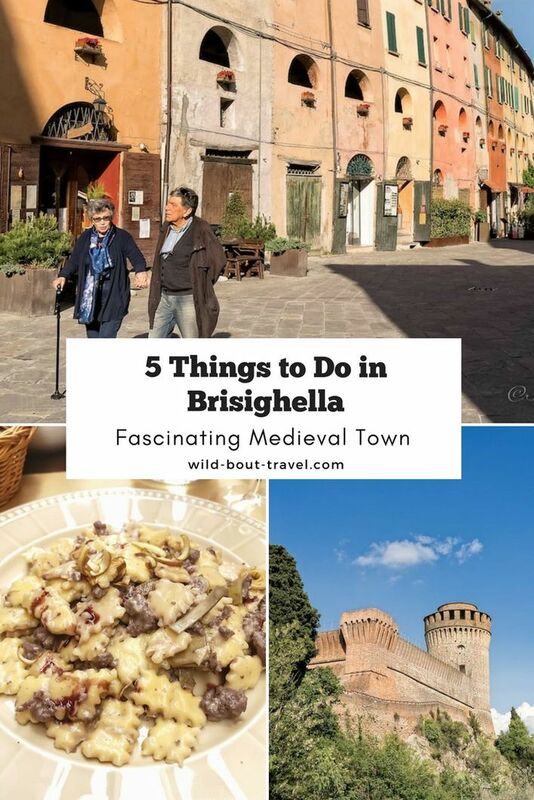 Would I have a hard time finding out what to do in Brisighella? 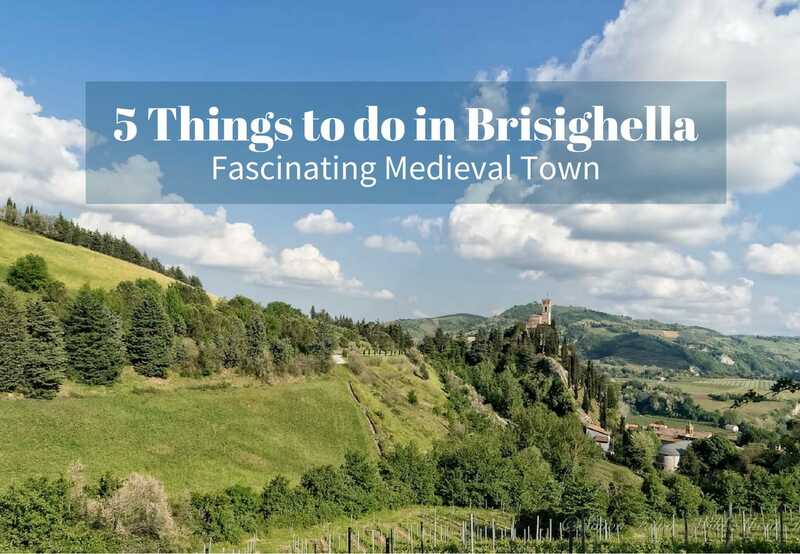 There are many lovely things to do in Brisighella. 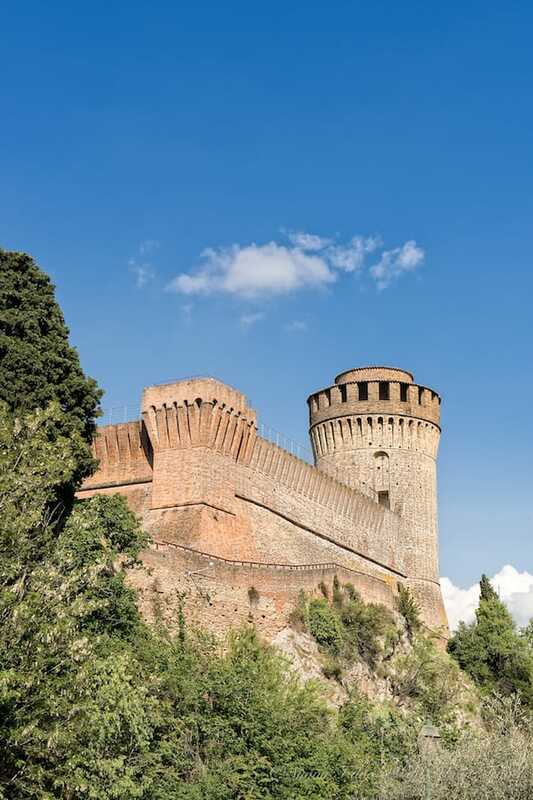 Brisighella is surrounded by three rocky hills, on top of which stand the fortified Castle (La Rocca), the Clock Tower and the Monticino Sanctuary. The oldest and most interesting monument is the Castle, which was built in the 14th Century and is a superb example of medieval military architecture. From there, a lovely path leads to the Clock Tower. 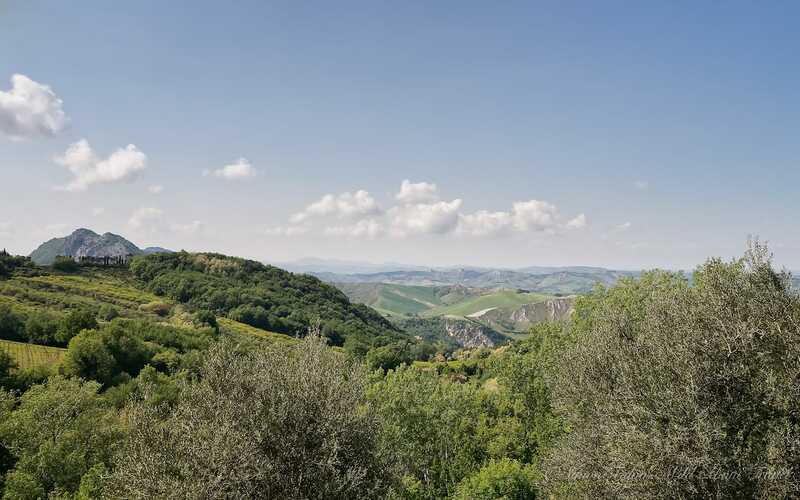 Bordered by cypresses and overlooking the vineyards, olive tree groves, and other cultivated land, the trail offers superb views of the rolling hills, painted in multiple shades of green. Luckily, there were only a few people the day I was there, so I savored every step, listening to the chirping birds and the whispering leaves. 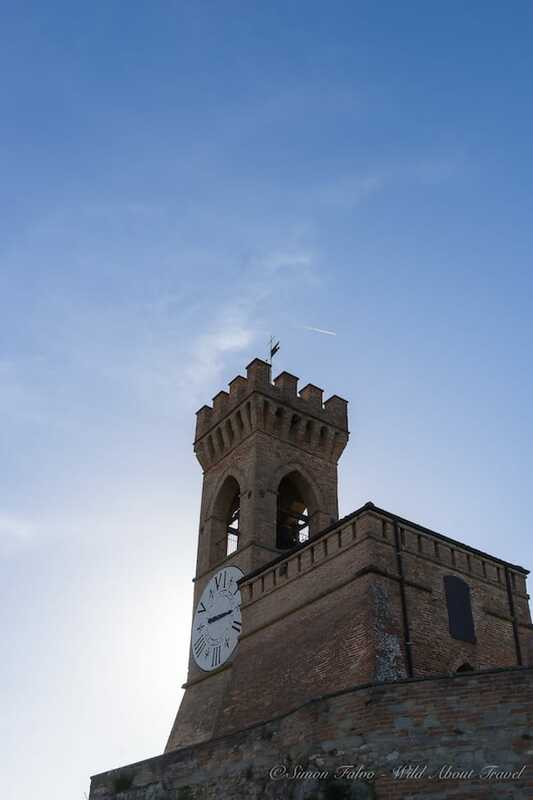 Initially built in the 13th Century for defensive purposes, the Tower Clock was damaged several times and rebuilt in its present form in the 19th Century. The view from atop is stunning, stretching from the colored houses with their tiled roofs gleaming under the sun to the green hills in the background. 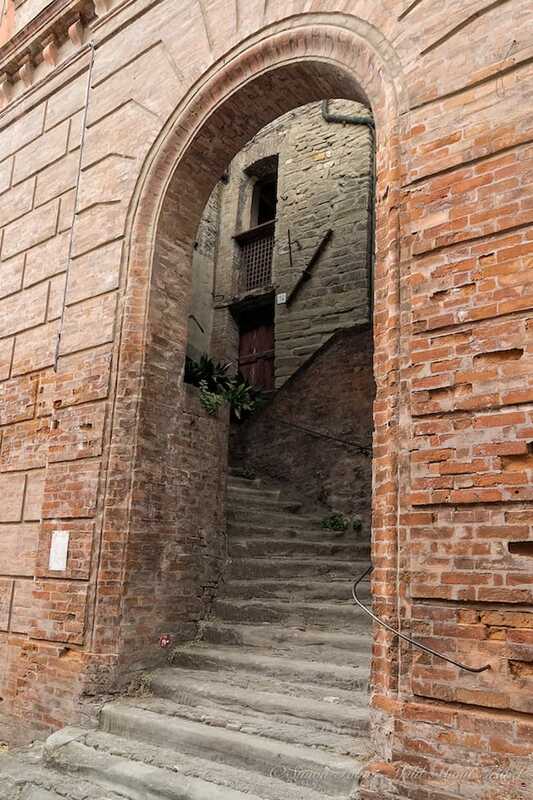 A steep alley leads back to the center of Brisighella, with more lovely spots along the way. I was surprised by how many delicious local products there are in such a limited area. 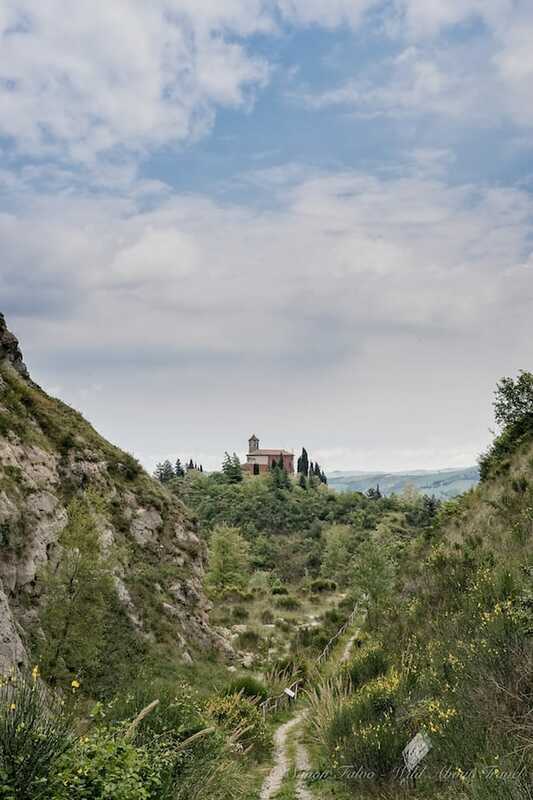 First and foremost, Brisighella is renowned for its olive oil. 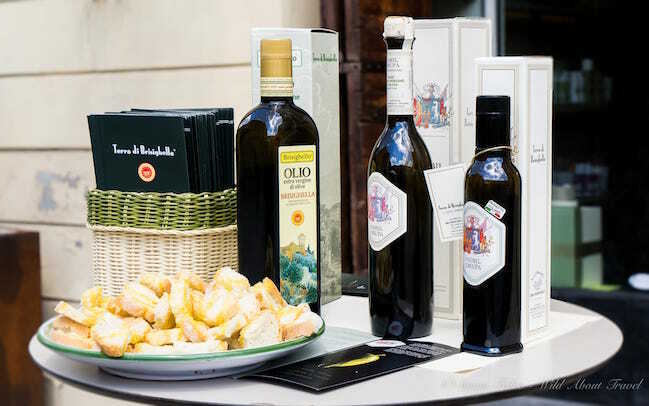 A PDO (Protected Designation of Origin) product, Brisighella extra-virgin olive oil is produced from a local variety of olives named “Nostrana of Brisighella”. 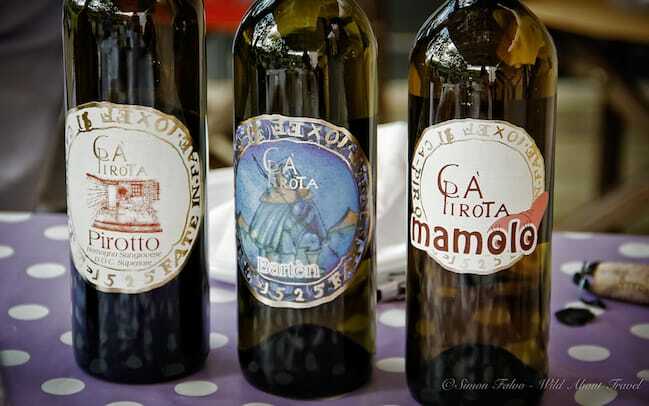 Its taste is peculiar and rather different from other common olive oils: slightly bitter and with a spicy note, experts recommend to add a few drops to fish and vegetables to enhance their flavor. 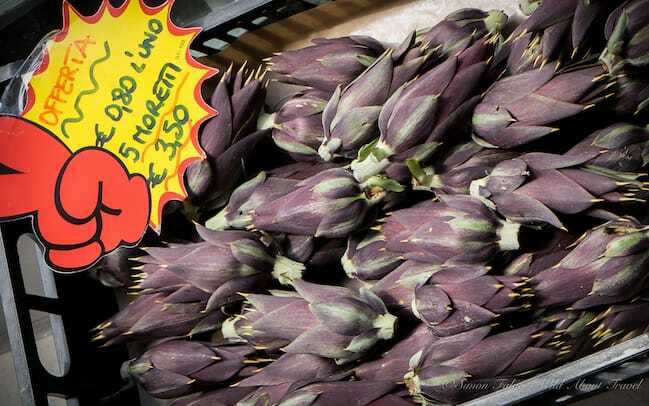 Another typical product of the “Moretto artichoke”, a natural variety that only grows in the shrubs surrounding Brisighella. Locals use every part of the artichoke: the heart in several dishes, the hard and bitter leaves to make herbal teas or liqueurs. Emilia-Romagna is the undisputed kingdom of home-made egg-based pasta, and across the region, there are so many variations of shapes, fillings, and recipes that you’ll hardly eat twice the same dish. In Brisighella I discovered the “Spoja Lorda”, of which I had never heard before. 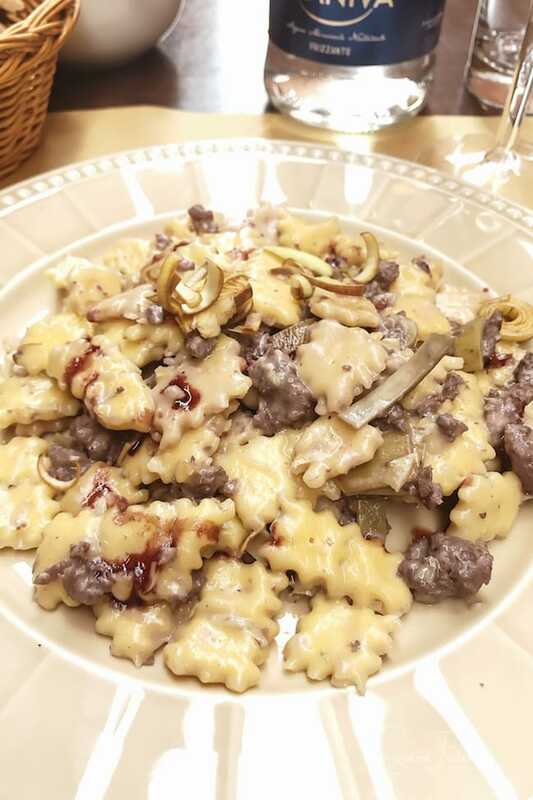 The ingredients are similar to other filled kinds of pasta, but when the housewives had little time, they would quickly brush the dough with the filling, close it and rapidly cutting it into squares. As with “tortellini”, the traditional recipe for spoja lorda is to eat the dumplings in broth, but today they’re prepared with different kind of fillings and often served with melted butter, sage and a generous sprinkle of Parmigiano Reggiano. Brisighella is small and you can’t get lost, therefore, the best thing is to explore every single alley, where you’ll always find some pretty details. Pastel colored facades in a tiny square, or a beautiful well sculpted in white stone, standing out from a large green door. 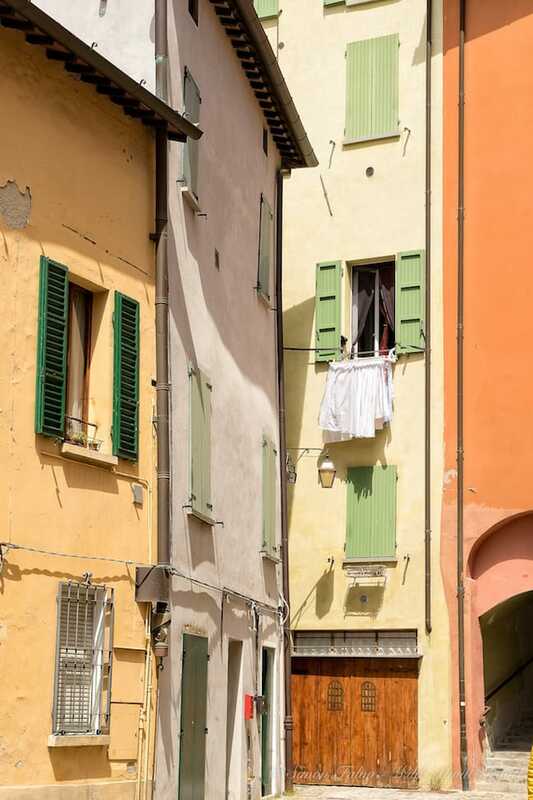 The best way to enjoy Brisighella is what French call “flȃner”: strolling slowly and randomly. I was blessed with a very nice weather, pleasantly warm, and since I love staying outside I couldn’t help sitting at one of the al fresco cafés and restaurants for a small bite or a drink, relaxing with a good book feeling surrounded by such an enchanting setting. Don’t miss to walk along the unique “Donkeys’ Alley” (Via deli Asini, also called Via del Borgo). I traveled quite a lot but had never seen before such a fascinating walkway. Built in the 14th Century, it was originally a military outlook (if you look up from the street, you’ll see semi-circular openings at regular intervals). Later, the path was covered and locals built houses, inhabited by the carters transporting gypsum from the nearby caves in their donkeys. 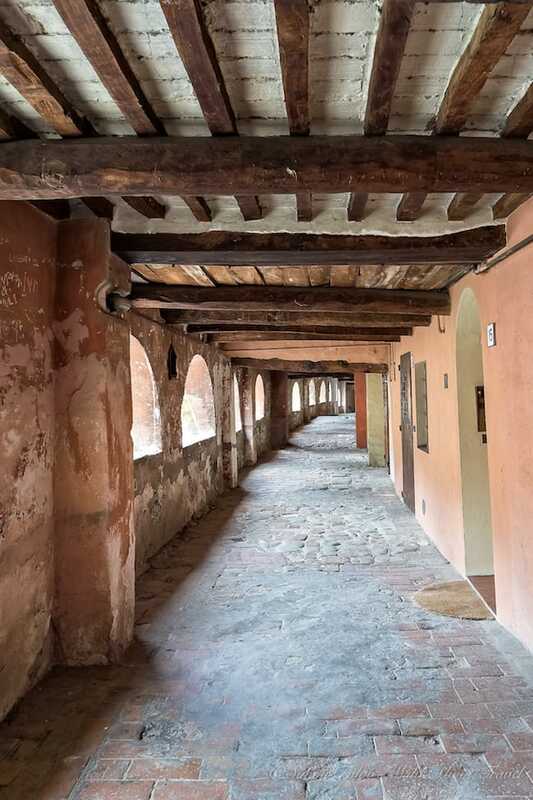 Walking along the path, paved with irregular large stones and covered by a ceiling with large wooden beams is quite an emotion and a very unusual experience. This was one of the highlights of my first visit to Brisighella: a short walk in the vineyards, tasting the wines of the Emilia-Romagna region paired with bites of local products and lastly chilling out by the pool. Not to speak about the warm and wonderful hospitality as we sat under the pergola, tasting wine and chatting with our host and feeling like old friends. I thoroughly enjoyed this half-day easy hike from Brisighella to the Rifugio Carnè, and the lovely views on the Apennines. Along the way, you’ll see the third hill and the Monticino Sanctuary and the old gypsum quarries, you’ll follow the path through bushes and woods until you reach the Carnè Hut, where you can eat and also sleep. Having started hiking late in the morning, I arrived at lunchtime and treated myself with a delicious course of Tagliatelle al ragù di Mora Romagnola, a typical and rare local pig which gives the sauce a heavenly taste. 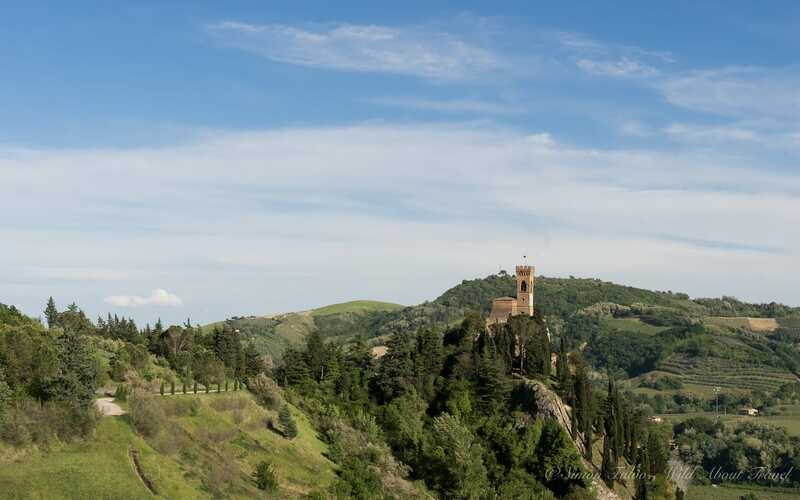 On the way back to Brisighella, rather than taking the same path I followed a different route (unfortunately, part of it is on tarmac), which offers lovely sights of the surrounding hills, and arrives at the castle, appearing from a different and charming perspective. 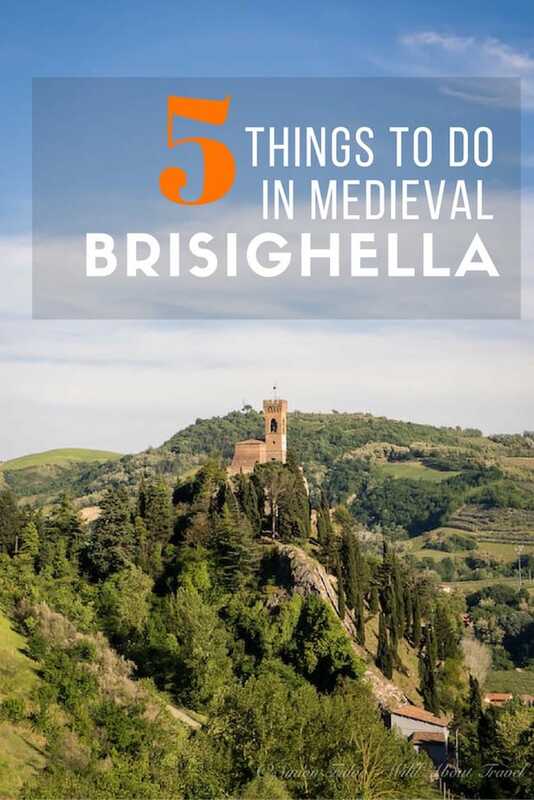 Indeed, there are more things to do in Brisighella which I did not experience, like taking a cooking class or having a longer hike in the regional park. That means only one thing: I’ll be back! 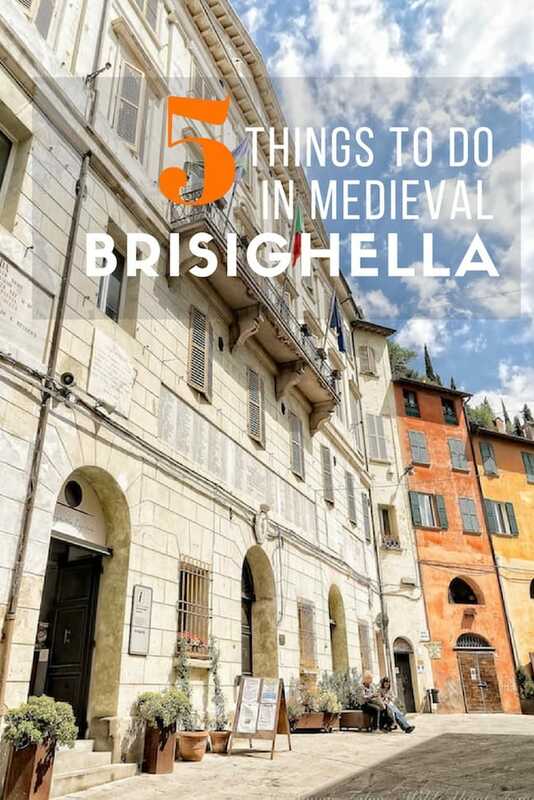 Start Planning your Trip to Brisighella! Flights: The nearest airport is Bologna which, however, is a small one with limited flights. If you’re coming from overseas, you’re likely to arrive in Milan or in Rome. Public transport: From Bologna, you can reach Brisighella by train via Faenza (sometimes it’s train+bus, depending on the schedule). The journey is about 1 hour/ 1 hour 15 minutes. Several high-speed trains every hour connect Milano Centrale to Bologna Centrale, in 60-75 minutes. Tip: Read my article on How to Save Money on Italian Trains. Car hire: I like a lot traveling by train and public transport, but a car certainly gives more freedom to explore. Renting a car at the airport and main train stations is easy, but beware that in the cities getting around is not easy, and parking is often even more difficult. 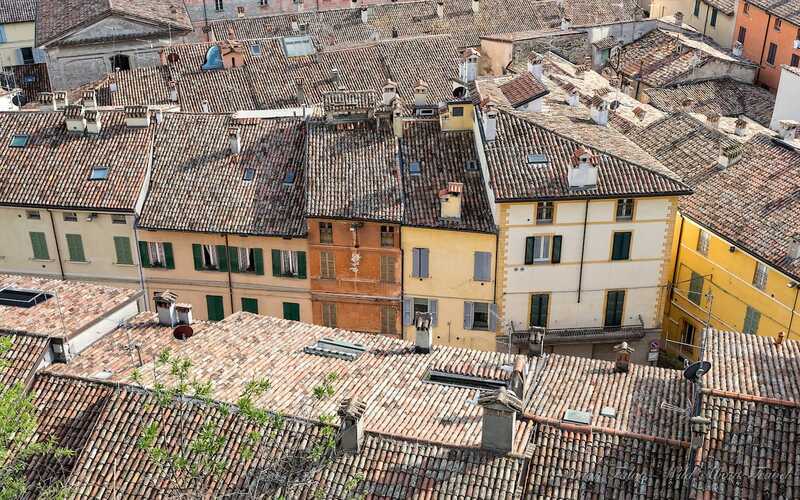 Where to sleep in Brisighella: There are several accommodations options, including B&Bs, Hotels, and Agriturismi (farm holidays in the countryside). 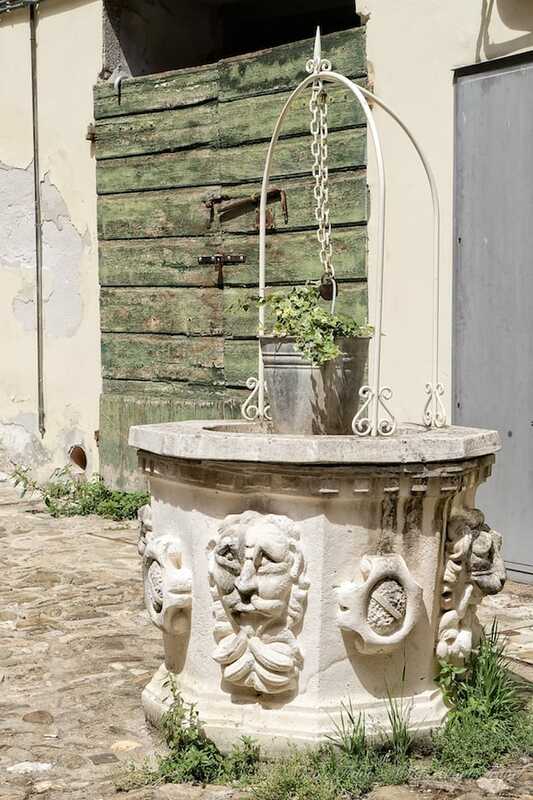 Had I been traveling by car, I certainly would have stayed someplace amidst the hills, but since I chose to use public transport, I stay at Modus Vivendi Rooms and Relax, a lovely B&B right in the center, recently refurbished and with also a small Spa in the basement. 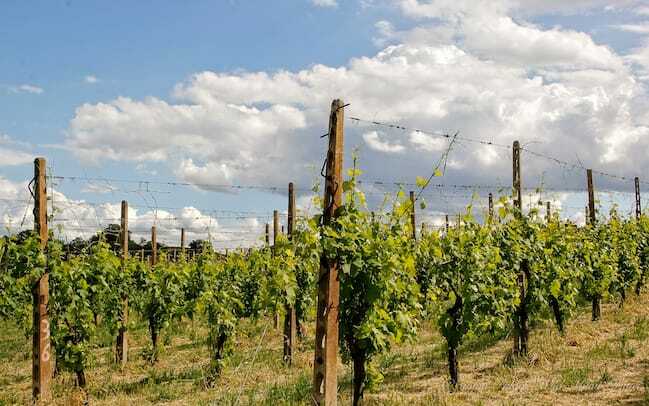 If you wish to stay in the countryside, but close enough to Brisighella, two good options are Azienda Agricola Baccagnano and Relais Varnello. The latter also boasts a small Summer outdoor pool. Where to eat: I had delicious food (at a fair price) at both Trattoria La Casetta and Cantina del Bonsignore. Don’t miss to taste the local specialties and ask for advice on their recommended dishes. Shopping: If you can bring with you only one thing, let it be the Brisighella Olive Oil, which you won’t easily find around. pay a visit to the shop Terre di Brisighella, where they’ll let you taste the extra-virgin olive oil, and explain you the differences. The store has also plenty of other gourmet food which is very tempting. In case you’re staying at an Airbnb apartment and have the chance to cook, the shop Arte del Matterello is the place to go. 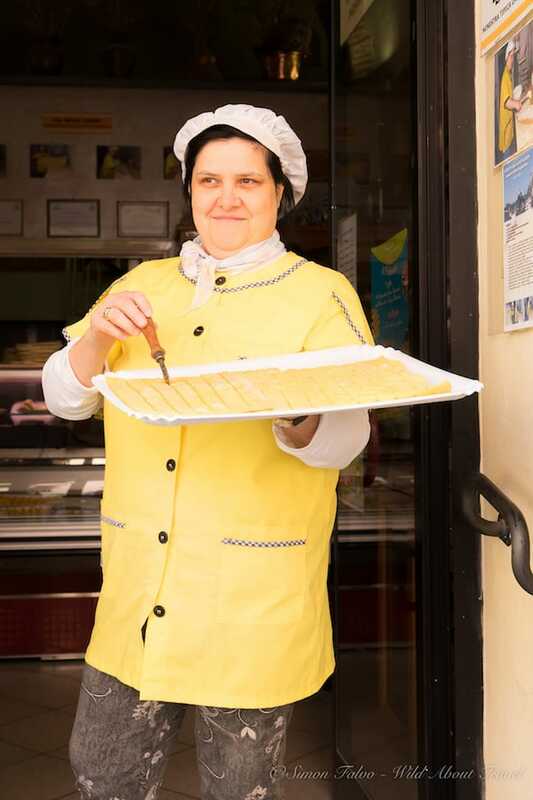 The lady that owns and runs the shop prepared a wide variety of home-made pasta that is just heavenly. This article includes a few affiliates links. This means that while the price is the same for you, I earn a small commission that helps running the website. Thank you! Beautiful countryside and looks like a wonderful village to explore for an afternoon. I’m heading to the region this summer and will keep this idea in mind! Thanks! 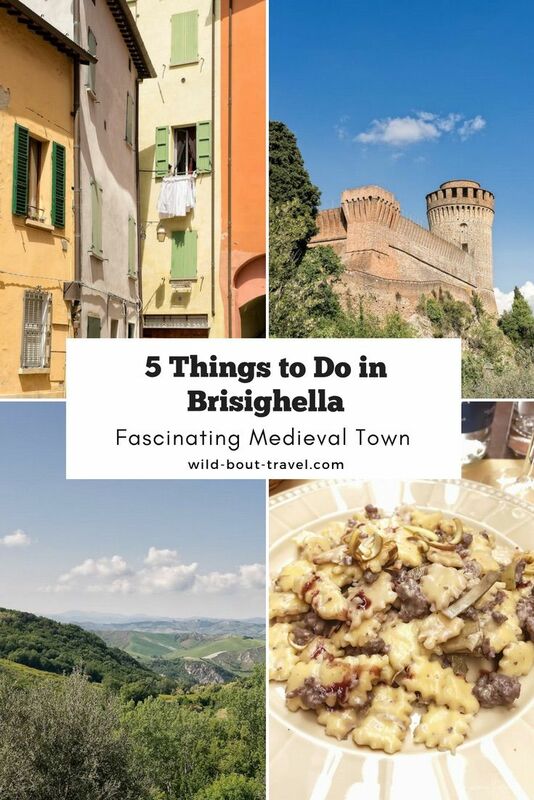 I’m sure you’ll like Brisighella!